Time Wasted Holding AT&T Stock? AT&T (NYSE:T) is our top dividend play for the next five years. We have been covering it from a number of different angles. Perhaps the most interesting of the discussions surrounded our analysis regarding the impact of FirstNet, which everyone is ignoring and this is a critical mistake. 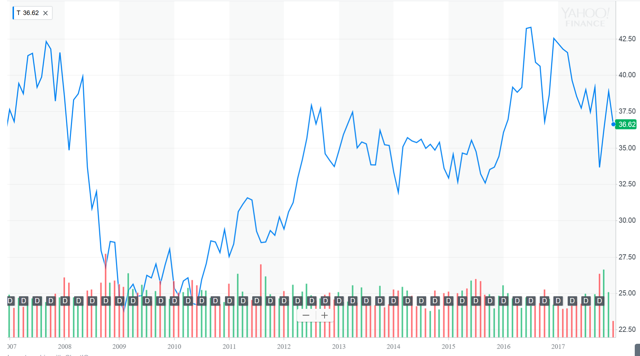 You see, this is a catalyst for growth, but make no mistake, this is still a dividend champion and that is the primary reason it is among our top long-term recommendations, particularly as the stock pulls back from $40 once again. Now, we previously predicted on a number of occasions that AT&T would hike its dividend to $0.50 by 2018. As expected, the dividend was hiked by another penny quarterly. What is interesting is that many readers on our home site and here at Seeking Alpha assailed this dividend hike, because as the bears correctly argue, cash really needs to be directed at reducing debt. However, the dividend, and the reliable annual dividend hike is a reason many own this name. This remains an ongoing debate here at Seeking Alpha. That is, can AT&T really keep raising the dividend? We contend yes, and that is why it is not dead money. In addition, the debt is painful, but the investments being made will ensure future revenues. With the DirecTV purchase and the pending Time Warner (TWX) purchase, there are strong sources of revenues, now and in the future, but the company has been saddled with debt. That is reality and so as much as we enjoy a pay raise, for the long-term health of the company, this debt needs to be paid down. By paying this debt down, while still upping its dividend payout by the way, the stock is incredibly attractive. Of all of the names in the sector, this is the one want to own because of the yield and the prospects for share appreciation. 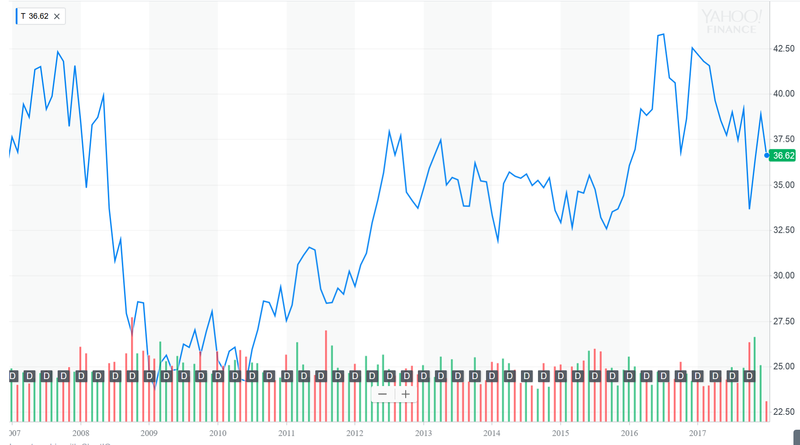 Any growth is a bonus, but it is not infrequent to hear bears call this name “dead money.” In this article we would like to demonstrate why a long-term position is anything but “dead-money” but also discuss the safety of the dividend. As we can see above, AT&T’s share price has not seen strong appreciation over the years, at least not compared to many other growth names or even the S&P 500. AT&T is well below its all-time high, despite the benchmarks seemingly making new highs every week. This is one reason some argue AT&T is dead money. It is true growth is slow. But you simply cannot forget about the dividend. Does this mean it is dead-money? We suppose someone who bought at the very top is down on paper, aren’t they? Let’s look at some numbers. Take a look at the past ten years of historical dividend payouts with three hypothetical buyers during this same time period. What we want to do is run some tests to see if there is any way someone who has been in this name for a few years has lost money, even if they bought at a terrible time. Take a look at the dividend history of AT&T over the last ten years. As you can see AT&T has had an amazing history of paying its shareholders. Still, we see that the present share price is still below pre-recession levels. Maybe in this sense the bears are correct that the stock is simply “dead-money.” But again, we didn’t buy this stock for growth. Sure, timing buys on dips is welcomed to capture some upside. That said, we do fully expect growth in the next five years, but we are in the name for the dividend payouts. The dividend now being at $0.50 is of course the highest it has ever been. The stock may be boring, but that is what we like. The stock is a boring, serial dividend raiser. When we consider this fact, the dead money argument withers. One way to show you how the dividend has made up for this lack of share appreciation is to show you some hypothetical numbers. First let’s assume “buyer 1,” bought at $37.53 in January 20. For simplicity, let’s assume our hypothetical investor purchased shares once and did not add on dips, sell a little when the stock ran up, or reinvest any of the payouts. As of the current share price of $36.78, this person would be DOWN on their investment $0.75, or 2.1%. That is terrible over a 10-year period. In fact, it really is dead money. Now this is where the power of a dividend comes into play. Dividends paid to this investor total $18.30 (including the $0.50 coming in February). So, instead of being down $0.75, the investment is up $17.55 on this investment. That’s a total of 47%. Certainly not dead-money, especially if this is in a tax favored account, or the dividends are being reinvested. It is not great, but this is why in reality, we have to time our buys. We should also point out that if the investor continues to hold and the dividend remains $0.50 indefinitely (it will absolutely get raised again) come 2028, this investor will have recouped his entire investment through dividends alone. You probably aren’t represented by buyer 1. What about buyer 2? Buyer 2 is one of the stronger (and luckier) investors who bought in when AT&T was just over $30. Let us assume buyer 2 purchased shares at $30.40 in January 2012 to catch the dividend hike. Once again, let’s assume buyer 2 purchased shares just once and did not add on dips or sell anything, etc. This investor would be up 21%. Not great in this bull market, but not that bad. However, we have to consider the power of the dividend. The dividends paid to date for this investor total $11.66. So, the investment is now up $6.38 in unrealized capital losses, but up $11.66 in dividends for a total return of $18.04. That is a total of 59.3%. That is a much better return in 5 years, an represents a safe and stable investment. Buyer 3 got in at the recent highs. He is down, but we want to demonstrate that time is on your side. Yes, once again we shall assume buyer 3 purchased shares just once and did nothing but hold. As of the current share price of $36.78, this person would be down a lot. In fact, they are down $6.39 or 14.8% on paper. That hurts in a year and a half time. But the dividend soften the blow right now the dividends paid to date for this investor total $3.42. So, the investment is now up $3.42 in dividends and down $6.39 in capital losses (on paper only) for a total loss of 6.8%. Still a shame over the time period, but it demonstrates the dividend’s ability to cut losses. This investor of course should be averaging down. Now, we have seen what happens when an investor collects the dividend after a single buy. What happens if an investor were to compound his purchase, by reinvesting dividends. Let’s take a fourth buyer who bought last week, at $38.00 per share, and invested a total of $30,000. Of course, this buyer is down on their investment by $1.22 per share. That said, with a $2.00 annual dividend, the yield on the investment is 5.44%. Let’s assume that the price doesn’t move, nor does the dividend payout. Let us also assume the investor holds the stock for 40 years (which we do recommend). Well, a $30,000 investment at these levels would be worth $260,000 at the end of the period. Now what if the stock grew an average of 4% a year as well? Well under the same circumstances the stock would be worth well over $400,000. Finally, if we assume the stock grows at 5% and the dividend at 2% annually, the investment would be worth a whopping $700,000 at the end of the investing period. Imagine if the investor added shares all along the way. Can the dividend continue to be paid out as it keeps getting hiked? Well, we believe so, because our projections for cash flow, and the dividend payout ratio are well within a margin that indicates safety. After the company reported Q3 earnings, it reiterated that it was aiming for $18 billion for the year in free cash flows. In Q3, free cash flow was substantially higher year-to-date than we expected. For the year, we also expect cash flows will approach $18 billion, but are still cautious. In addition, our expectations of $5.1 billion in free cash flow was greatly surpassed last quarter, as the actual figure was well over $5.8 billion. This brings us to the dividend payout. We calculate this indicator by taking ratio of the dividends paid out in the quarter over free cash flow generated in the quarter, times 100%. Based on the actual results for free cash flow of $5.8 billion, and the amount of dividends paid (almost $3 billion), the payout ratio of 51.3% was extremely favorable. This strongly suggests that the dividend is safe as it is more than covered by free cash flow. While the dividend hike has a negative impact to the payout ratio if free cash flow remains flat, we project the payout ratio will remain comfortably under 70% for all of 2018 as we see cash flows increasing, especially if the Time Warner deal closes. We see the dividend as secure based on projections for cash flows for 2018, and especially if the Time Warner deal closes. The dividend is the reason we own this name. There are a lot more stocks out there that move so much more day-to-day. This is why the name is considered boring by many. It is also why many consider it “dead money”. We do not see it that way. The dividend is anything but dead money. For those that are in this game for the long run, we would like to remind you of the power of the dividend to make up for weak capital gains. In addition, those that reinvest the dividends can compound their investments. The results of power and time speak for themselves. AT&T is not dead money.